The CardPress is an online tool which allows you to design and order high quality greeting cards ready to sell. Creating a CardPress account allows you to upload images to pre-designed templates, it’s easy to add and remove graphic elements as required. Add envelopes and cellophane bags as an option. The envelopes we supply for all cards are good quality plain white 100gsm with a V-shape gummed flap. You can download a free pdf proof to check how the card will look. If you require a machine proof, please email hello@thecardpress.co.uk for a quote. I've made a mistake in my order, can I cancel it? Please inform us quickly, in writing, that you'd like to cancel your order to avoid charges for any work that has already been started. Please read our returns and refund policy for further information. What paper can I choose? Invercote has a smooth matt coated surface on the print side with a tactile uncoated reverse side for easy writing on the inside. This material works well for all types of card designs. GF Smith Accent Antique is a premium quality textured material in alabaster (high white shade). Unrivalled look and feel and works beautifully for traditional designs or to give an exclusive appearance to cards. We will arrange for your work to be delivered to the address for delivery indicated in your order, the normal method of delivery (unless specifically agreed otherwise) shall be by an overnight courier service with delivery any time between 8am and 6pm. We will use reasonable endeavours to deliver work within 3 to 5 days from receipt of your order but this can depend on seasonal workflows and the quantity of cards required. We will contact you if any delay is anticipated. Unless we expressly agree otherwise, we will only deliver work within the UK. Any international deliveries which we agree may be subject to customs clearance and local country restrictions may apply. We will not be responsible for any customs and excise charges that may occur from the import or export of your goods. In some circumstances we may have to despatch your order in multiple shipments. You will be informed by us if this will happen and you will not be charged for additional deliveries unless a special service is requested. Please ensure that you check the integrity of the packaging of your delivery before signing for it. Your greeting cards will be printed climate neutrally using presses powered by solar energy. With help from ClimatePartner we calculate the CO2 emissions of the specific printed product, the emissions caused by the production of the raw materials, the print process and transportation are all taken into account. The CO2 emissions are offset by supporting a recognised carbon offset project that reduces CO2 emissions effectively, our chosen project is Kasigau Wildlife Corridor, Kenya. On completion of your cards we will email you a certificate verifying the calculation. 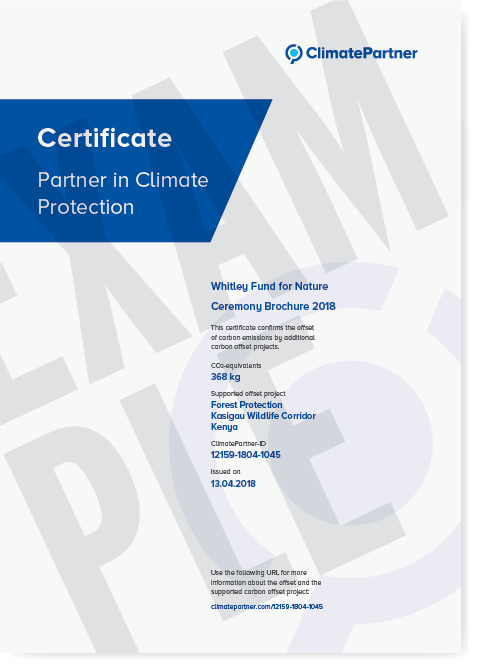 We make the contribution to climate protection on your behalf, we are your partner.